Journey Into Mystery # 83 Golden record Reprint 1966. Comic is graded fine plus. Please see scan for condition. Bagged and boarded (mylite and fullback). 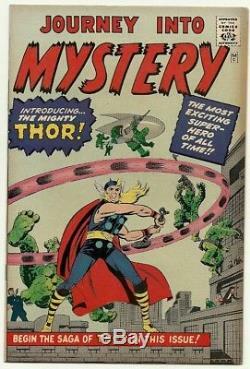 The item "Journey Into Mystery # 83 1ST Thor GRR 1966" is in sale since Thursday, May 31, 2018. This item is in the category "Books, Comics & Magazines\Comics\US Comics\1956-1969 (Silver Age)\Avengers". The seller is "silver-key-comix" and is located in Glasgow. This item can be shipped to United Kingdom, United States, Japan, Canada, Ireland, Australia, Germany, France, Greece, Italy, Spain, Austria, Belgium, Bulgaria, Croatia, Cyprus, Czech republic, Denmark, Estonia, Finland, Hungary, Latvia, Lithuania, Luxembourg, Malta, Netherlands, Poland, Portugal, Romania, Slovakia, Slovenia, Sweden, Brazil, New Zealand, China, Israel, Hong Kong, Norway, Indonesia, Malaysia, Mexico, Singapore, South Korea, Switzerland, Taiwan, Thailand, Saudi arabia, South africa, United arab emirates, Ukraine, Chile.